Reminder: Legends of Equestria is now recruiting! Are you enjoying the open server weekend? Ever had an urge to help make the game? We are currently accepting applications for the following departments: Concept Artists, 3D Modelers/Animators, Texture Artists, Public Relations, Server Managers, Programmers, and Web Designers. All applicants must be at least 16 years of age. Applicants must be comfortable drawing building exteriors, interiors, environmental art, and creatures in the style of the show. In order to apply for a concept artist position, please email [email protected]. Your email should consist of a link to your online portfolio, your Skype username, your primary email address, the amount of time you're able to devote to Legends of Equestria, and your reason for wanting to join the project. Please note that your portfolio should include something other than My Little Pony fan art. To apply for the 3D team, please email [email protected] with links to examples of your skills. Any additional unrelated, high quality designs you have done helps too. Applicants must have working knowledge of 3D modeling and/or animating and be willing to learn, design critically, and give and take critique. It is preferred that applicants have a specialty in organic modeling, 3D animation and rigging, terraforming, or any combination thereof. Please include how much time you are able to devote to Legends of Equestria, as well as a list of programs that you use. Applicants must be able to produce textures and graphics in the style of the show, have experience working with color, an adequate amount of time they are willing to devote to Legends of Equestria, and a willingness to follow directions from their team leaders. Experience in unwrapping and texturing models is favorable, but not required. In order to apply for a texture artist position, please email [email protected] and [email protected] with examples of your work, and a description of your skills/experience in digital art. Examples of environmental and architectural work are preferable. 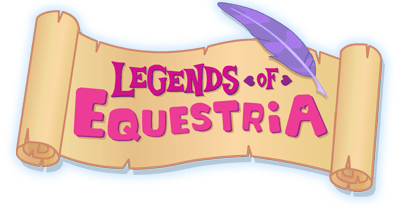 Please also list the programs you use within the email, as well as the reason you are interested in joining Legends of Equestria. Applicants must have excellent writing and social media skills. Knowledge of journalism, social media analytics, and public speaking optimal, but not required. In order to apply for a public relations position, please email [email protected] with a short writing sample explaining your qualifications and drive. You can also submit an application through forum messaging. To apply for the design team, please email [email protected] with examples of design materials, as well as how much time you are able to devote to the project. Examples should include design documents which focus on gameplay mechanics, systems, and the equations and numbers which make those systems tick. Potential design team members should be able to contribute to discussions about a wide range of complex design topics related to a MMORPG, as well as independently write or sketch complex design documents which focus on attribute balance and gameplay integration. Please note that extensive fan fiction or creative writing work does not consist of the type of materials that I am looking for. Map/ level designers should have drawn work (hand or digital) of macro or micro scale level designs which factor in standard gaming conventions such as pathing, points of interest, mob spawns, elevation, framing, terrain features, quest potential, etc. Previous experience in a 3D engine (Unity, Unreal) is highly sought after. Map/level designers should expect to be trained in Unity to allow the implementation and editing of their designs. Please email [email protected] with examples of your work. Server managers will be responsible for the administration and support of Linux based systems. You must provide Linux server support and will be expected to contribute to the documentation and maintenance of the Legends of Equestria game servers. Also, you must be willing to document procedures when setting up new servers. Work with the programming team. Experience with Bash scripting required. Please email [email protected] with a list of your qualifications and your Skype username.